During his three decades on the Supreme Court, Justice Kennedy often provided the crucial swing vote in the Court’s major Fifth Amendment takings decisions. 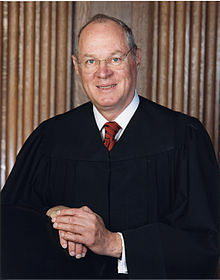 Justice Kennedy thus played a pivotal role in developing modern takings law. When Justice Kennedy joined the Supreme Court in 1988, the Court had only begun to grapple with the takings implications of federal regulatory schemes on private property. At that time, the test was quite rudimentary for determining when the Fifth Amendment’s requirement that “nor shall private property be taken, without just compensation,” applied and it gave little guidance to trial courts. Under the leading cases of Pennsylvania Coal Company v. Mahon and Penn Central Transportation v. New York City, judges were told simply to look at the totality of the circumstances to determine if a regulation had “gone too far” and thus violated the Fifth Amendment’s Takings Clause. Soon after Kennedy joined the Court, however, takings jurisprudence began to take on more definite contours as the Court started to draw lines that the lower courts could apply with greater certainty. In the landmark case of Lucas v. South Carolina Coastal Council, for instance, Justice Kennedy joined Justice Scalia’s majority opinion in which the Court announced a newly formulated per se taking rule. In Lucas, the Court held that if a regulation took all the economically beneficial and productive use of land, that action would be recognized as a taking without regard to other factors. In Dolan v. City of Tigard, Kennedy joined in the 5–4 majority holding that a local government’s permit conditions imposed on private property must be “roughly proportional” to the public burdens created by the proposed land use. In Phillips v. Washington Legal Foundation, he supported the Court’s 5–4 holding that the public’s use of interest earned on lawyer trust funds violated the Just Compensation Clause. ABA Section of Environment, Energy, and Resources Trends Nov/Dec 2018. In Koontz v. St. Johns River Management District, Kennedy agreed with the 5–4 holding that the government may not conditionally approve land-use permits unless the conditions are connected to the proposed land use, and disproportional conditions can be challenged even if the permit had not yet been granted. In Kelo v. City of New London, he joined the 5–4 majority holding that condemnation of a private property for private economic development as defined in the city’s economic development plan qualified as a “public use” within the meaning of the Fifth Amendment. In the 5–4 majority decision in Horne v. Department of Agriculture, Kennedy joined in the holding that the U.S. Department of Agriculture’s regulation imposing a reserve requirement on the sale of raisins constituted a per se taking because it could not be fairly characterized as a voluntary exchange for a governmental benefit. Were the Court to accept that rule, the postenactment transfer of title would absolve the State of its obligation to defend any action restricting land use, no matter how extreme or unreasonable. A State would be allowed, in effect, to put an expiration date on the Takings Clause. This ought not to be the rule. Future generations, too, have a right to challenge unreasonable limitations on the use and value of land. Like the ultimate question whether a regulation has gone too far, the question of the proper parcel in regulatory takings cases cannot be solved by any simple test. See Arkansas Game and Fish Comm’n v. United States, 568 U.S. 23, 31, 133 S. Ct. 511, 184 L. Ed. 2d 417 (2012). Courts must instead define the parcel in a manner that reflects reasonable expectations about the property. Courts must strive for consistency with the central purpose of the Takings Clause: to “bar Government from forcing some people alone to bear public burdens which, in all fairness and justice, should be borne by the public as a whole.” Armstrong, 364 U.S. at 49, 80 S. Ct. 1563. Treating the lot in question as a single parcel is legitimate for purposes of this takings inquiry, and this supports the conclusion that no regulatory taking occurred here. Supreme Court nominees have a way of charting their own courses once they take their seats on the Court. Justice Kennedy was not, at the time of his appointment, perceived as the key swing vote on Fifth Amendment just compensation cases (nor on other key issues for that matter). The person who replaces him may or may not be influential on takings issues—and any one of the nine could turn out to be the new swing vote. Nancie G. Marzulla is an attorney in Washington, D.C. whose practice focuses on Fifth Amendment takings cases, property rights, and environmental claims. She has participated in virtually all of the landmark takings claims in the Supreme Court. ©2016. Published in The Business Lawyer, Vol. 71, No. 4, Fall 2016, by the American Bar Association. Reproduced with permission. All rights reserved. This information or any portion thereof may not be copied or disseminated in any form or by any means or stored in an electronic database or retrieval system without the express written consent of the American Bar Association or the copyright holder.